Egyptian-style, pink and grey mausoleum created for the second Earl of Kilmorey. The form relates to the shrines at the heart of Egyptian Temples. The 2nd Earl of Kilmorey built this mausoleum in 1854 on a plot he had secured at Brompton Cemetery. The pink and grey Egyptian style mausoleum cost over £30,000 and was moved by the Earl two times before his death at the age of 92 in 1880. Kilmorey spent much of his early life in Twickenham with his mistress, Priscilla Hoste. Their relationship developed from his friendship with her parents Captain William Hoste and Lady Harriet Walpole. When Captain Hoste died, the Earl became a guardian of the children and in the early 1840s he eloped with Priscilla. A search was mounted but it appeared that they had fled abroad, without trace. After their return to England, their son, Charles, was born at Cross Deep House on the 19th of July, 1844. When Priscilla became ill in 1851 with terminal heart condition, Kilmorey began making preparations for her burial and in 1853 wrote to Brompton Cemetery regarding a select plot. It took over a year for the details to be settled and approved by the Home Secretary and cost Kilmorey £1,030 16s 9d. The architect, Mr. H.E. 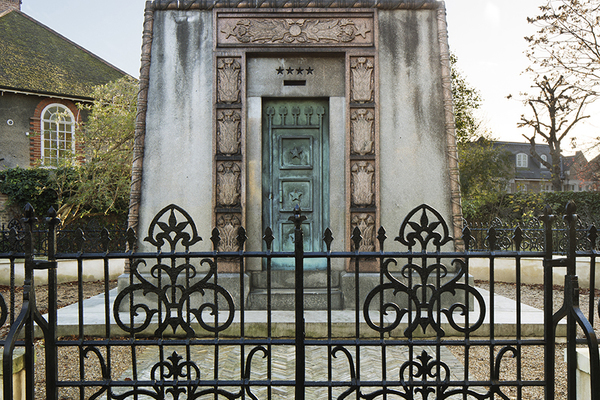 Kendall, designed the £30,000 mausoleum to fit the circular plot at Brompton Cemetery which measured 1,963 square feet. The Egyptian design is believed to have been derived from a plate in a French book Description de l’Egypte published in 1809. The shape of the building relates to the shrines at the heart of Egyptian Temples – the place where a treasured image of a god was installed. At Gordon House the Earl made a tunnel to the mausoleum and it is said that, dressed in white and laid in his coffin, he would get his servants to push him on a trolley down the tunnel for practise. The mausoleum is now the responsibility of the London Borough of Richmond upon Thames. The grounds are maintained by volunteers who have also improved the area.